With special radios fitted in vehicles, commute time could be significantly reduced, especially during rush hours. Innovations to improve the good old traffic light have been few and far between. One of these, recently pilot-tested in Hamburg, involves light assistants that show drivers recommended speeds for different phases of the road ahead so that the journey means less stopping at traffic signals and a smoother, more fuel-efficient ride. Enough data has been collected for the project to be implemented, recommending green times to drivers. In Los Angeles, a system of intelligent traffic lights is planned for 1,500 intersections. Touted as a solution for smart cities, it involves a large control cabinet that will help the lights adapt to situations and control guide lights for bikes, crosswalks and more. Portland, too, is testing a system to reduce waiting time. India is also supposed to get Japanese traffic lights fitted with 360-degree cameras so that these can look around and adjust 'go' time. A group of researchers, led by R. Zhang at the Carnegie Mellon University in Pittsburg, Pennsylvania, has demonstrated an intelligent transportation system (ITS) where traffic lights are activated by dedicated short-range communication (DSRC) radios fitted in vehicles. The idea is to reduce travel or commute time significantly, especially during rush hours. The outcome reported in a research paper claims that the overall performance of the system is superior to current traffic control even when only 20 per cent of the city vehicles are equipped with the radios. 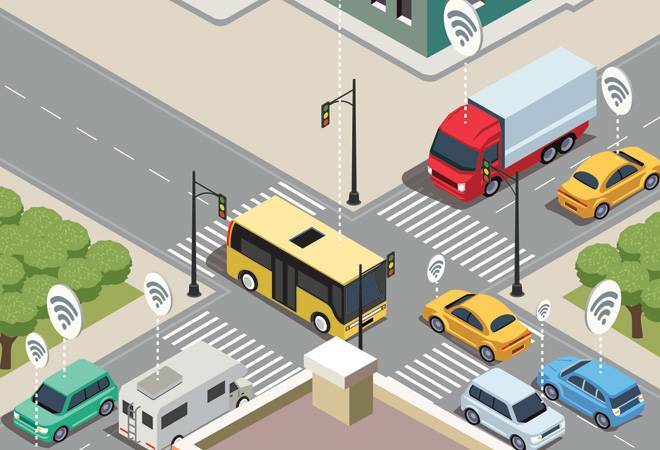 The research group also points out that the traditional ITS employs intelligent intersections that can detect vehicles by using loop detectors, magnetic detectors or cameras, and then actuates traffic lights accordingly. But these solutions are costly and hence, could not be scaled in most cities over the past three decades. In contrast, new vehicles with pre-installed DSRC radios can easily enable vehicle-to-infrastructure (V2I) communications based on a vehicle-detection method, which would make the system viable. Moreover, this one has several benefits compared to other detection methods. First, it is a robust system that can deal with brightness, illumination and weather conditions. Second, it is easy to implement and maintain. There are other DSRC-based solutions, but unlike this system, they require every vehicle to be fitted with a radio, again adding to costs. Field trials show that the new system can sense vehicles continuously when they are more than 100m away from an intersection. This feature also supports the viability of the new sensing technology for intelligent intersections. The world's smallest reflective liquid-crystal display device in full HD has a long name. Sony calls it SXRD241A, which is a compact portable projector displaying distortion-free images even on a curved surface. Sony has used its fine pixel pitch technology that reduces the pixel pitch to achieve high resolution. Dot pitch, a specification for computer displays, printers, image scanners or other pixel-based devices, describes the distance between dots or subpixels on a display screen. It is measured in millimetres and a smaller number means a sharper image. The company has also used improved light-shielding, an all-new field-sequential colour technique and its original SXRD technologies developed for 4K home projectors, resulting in high resolution, high brightness and high contrast. As the projector is portable and able to use any surface, it is slated to be a game changer. Imagine taking a gadget out of your pocket and projecting anything using a cylindrical cookie tin. Sony has incorporated a high-definition signal processing function to maximise its SXRD properties. Plus, you will find a geometric compensation function and an edge-blending feature for correcting image distortions.